Wayfarers Cottage01263 715779work01603 870304fax Self-cateringWayfarers Cottage, on one level and close to the working farm of the owner with its large garden, is situated in Mattishall in Norfolk. The village with shops and a pub is only five miles away from Dereham, a market town with cinema, restaurants and a sports centre. Beamed ceilings throughout the property add to its character. 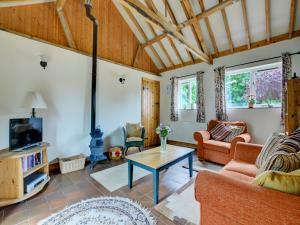 Wayfarers Cottage offers weekly bookings starting on Saturday. Wayfarers Cottage, on one level and close to the working farm of the owner with its large garden, is situated in Mattishall in Norfolk. The village with shops and a pub is only five miles away from Dereham, a market town with cinema, restaurants and a sports centre. Leave A47 Dereham bypass at Etling Green, follow brown windmill sign until Mattishall is signed. Take this road to T-junction. Take left turn and then 1st right into Old Hall Road, go past farm gates, enter house drive. From Norwich - 18 miles. Norwich station follow signs to A47 (then as above).